Design for the Typ 180 with the turret mounted toward the front. Design for the Typ 180 with the turret mounted at the rear. Engine cross-section of the Typ 180 with the turret mounted at the rear. The turret of the VK 4502 (P) was developed after Dr. Porsche informed Wa Preuf 6 that the 8.8cm Flak 41 could not be installed in the turret of the VK 4501 (P) on June 21, 1941. By May 7, 1942, the design seems to have been finalized because Krupp reported difficulties shaping the rounded turret front of the turret. 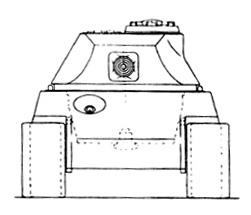 The rounded front of this turret was developed to reduce frontal target area, and would not have presented the shot-trap common to the initial production Henschel Tiger II's because the designs of the hull tops differend (at least on the design with the turret forward). 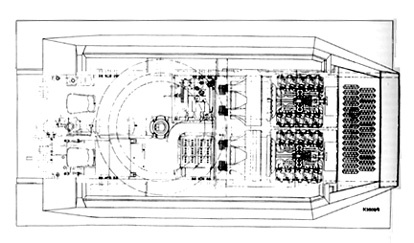 Top view of the Typ 180 with the turret mounted toward the front. Front view of Typ 180 with the turret mounted at the rear. Unfortunately for Dr. Porsche his fascination with advanced engine design let to the ultimate failure of the VK 4502 (P). The 10-cylinder engines failed during trials, and there was no confidence that the design would bear fruit (given previous Porsche failures using the same drivetrain layout). In November of 1942, all of the contracts relating to the VK 4502 (P) were rescinded. Work did, however continue into the middle of 1944. By that time the vehicle had hydraulic drive, new suspension, a 900 metric horsepower air-cooled disel, and heavier armament with delivery schedule "far in the future." Ultimately the turrets were converted for use on the Henschel Tiger II. Top view of Typ 180 with the turret mounted at the rear.